James Harris Gallery | "Tectonic Dynamics"
James Harris Gallery is pleased to present a show titled Tectonic Dynamics and will include the works by Evan Nesbit, Gibran Mevlana, and Brandon Lattu. The exhibition explores the ideas of change in structural and formal constructs of painting, photography and sculpture through the use and application of specific materials. By combining diverse components or using traditional mediums in an unconventional way, the artist’s hope to challenge viewership and critique pictorial space. All of the work selected for the exhibition is fundamentally linked to light and how observation is mediated by it. Light is absorbed or reflected by surfaces and artists often apply and choose specific materials to give the viewer a means to question their own perception, knowledge and experience. 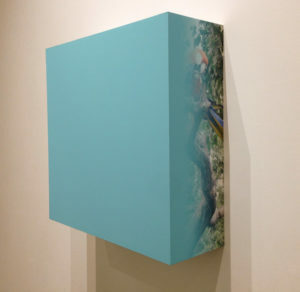 Illusion is something that all three artists in this show work with to investigate the formal constructs of an artwork. 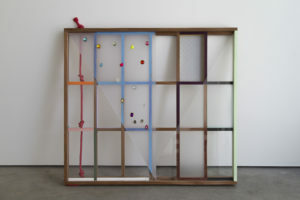 Gibran Mevlana uses wood, Plexiglas, paint, rope and plastic to create free standing and wall mounted sculpture. These diverse materials are employed by the artist not only for formal relationships but also used to activate surface and challenge the visual weight of an object. 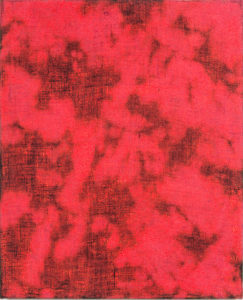 Her unique combination of materials destabilizes how the viewer perceives each work as they experience it. 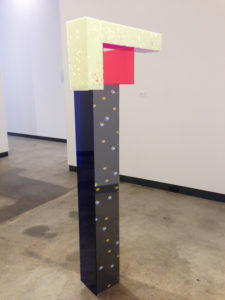 “After Dark,” a free standing work is fabricated from wood and acrylic plastic; the surfaces painted, punctuated with laser cut holes or applied with photographic reproduction. The sculpture’s verticality is interrupted by skewed geometric forms where translucency contradicts solidity. The visual weight of the work changes as the viewer experiences the piece. 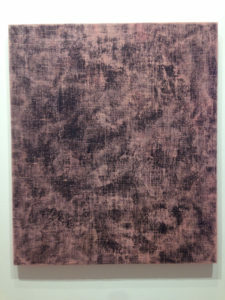 Painting is pushed optically through the combination of acrylic paints and dye on brown burlap in Evan Nesbit’s work. Physically, Nesbit does something quite interesting in the way he plays with paint as is protrudes through and soaks into the burlap. At times, the paint comes out into the viewer’s space physically and forms a sculptural layer on the surface. It is three-dimensional and enticing, the closer one gets to the wall. The results provoke the viewer to engage in an active participatory role, as the gaze conflates the static physicality of the canvas with the natural saccadic movement of vision. 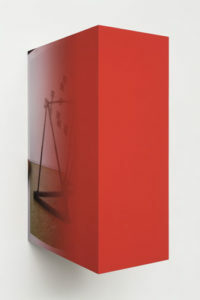 Highly influenced by phenomenological philosopher, Maurice Merleau-Ponty; Nesbit harnesses philosophical investigations of human perception to address issues within image making in an effort to not only exist as an object, or momentous glance, but as an invitation for a suspended visceral exchange. Brandon Lattu’s photographic process expands beyond the traditional two dimensional constructs of a photograph. 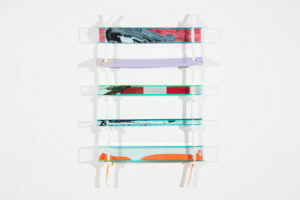 In the series “Random Composition,” the artist creates a three dimensional object with four different photographs that occupy the sides, top, and bottom. The face is composed of a plane of monochromatic color. At first glance they present a minimalist color block to the viewer but it’s surrounded by photographs that connect to the wall. The viewer observes a pictorial shift from the illusion of space captured by the camera yet interrupted by the solid color. The objects are generated randomly: the dimensions of the piece, the color of the front, and the selection of images from an archive of almost 100,000 photographs. Lattu does not subjectively compose them, but after they exist virtually as ready-mades constructed with this system, he fabricates ones that are chosen in a fashion that relates to the kind of selection process that a photographer has traditionally made while looking at a contact sheet. Tectonic Dynamics is an optical investigation of spatial perception by three artists, each demonstrating structural shifts through visual clues, All three artists currently work and live in California. 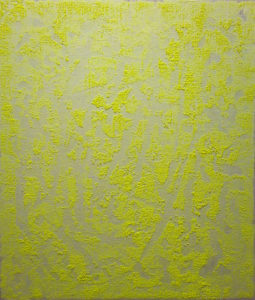 Evan Nesbit is a graduate of Yale University and has recently exhibited at Roberts & Tilton. Gibran Mevlana recently graduated from Art Center and this exhibition marks her first at a gallery. Brandon Lattu teaches photography at University of California Riverside and currently has work in a group exhibition at the Metropolitan Museum of Art. 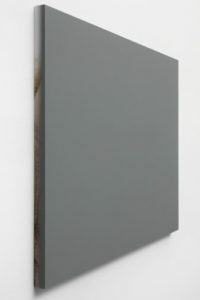 He shows with Koenig and Clinton in New York and has exhibited internationally. 70" x 24" x 12"
46" x 27" x 4"
41 1/2" x 46" x 4"
Brandon Lattu, "Random Composition 4-64"
24" x 9" x 16"